What is the MIN Function? The MIN function is categorized under Statistical functionsFunctionsList of the most important Excel functions for financial analysts. 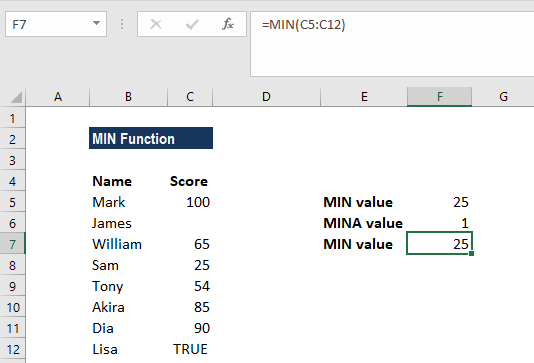 This cheat sheet covers 100s of functions that are critical to know as an Excel analyst. MIN will return the minimum value in a given list of arguments. From a given set of numeric values, it will return the smallest value. Unlike the MINA function, the MIN function ignores numbers, text, and logical values TRUE and FALSE and text values. In financial modelingWhat is Financial ModelingFinancial modeling is performed in Excel to forecast a company's financial performance. Overview of what is financial modeling, how & why to build a model. A 3 statement model links income statement, balance sheet, and cash flow statement. More advanced types of financial models are built for valuation, plannnig, and, the MIN formula can be useful in calculating debt schedulesDebt ScheduleA debt schedule lays out all of the debt a business has in a schedule based on its maturity and interest rate. In financial modeling, interest expense flows into the income statement, closing debt balance flows onto the balance sheet, principal repayments flow through the cash flow statement, completing the scheudle and depreciation schedulesDepreciation ScheduleA depreciation schedule is required in financial modeling to forecast the value of a company's fixed assets (balance sheet), depreciation expense (income statement) and capital expenditures (cash flow statement). In financial modeling, a depreciation schedule is requried to link the three financial statements in Excel. Number1 and number2 are the arguments used for the MIN function, where Number1 is required and the subsequent values are optional. In MS Excel 2007 and later versions, we can provide up to 255 number arguments to the MIN function. However, in Excel 2003 and earlier versions, it can only accept up to 30 number arguments. Arguments can be provided as constants, or as cell references or ranges. 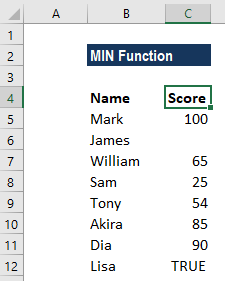 If an argument is supplied to the function as a reference to a cell, or an array of cells, the MIN function will ignore blank cells, and text or logical values contained within the supplied cell range. However, logical values and text representations of numbers that are supplied directly to the function will be included in the calculation. 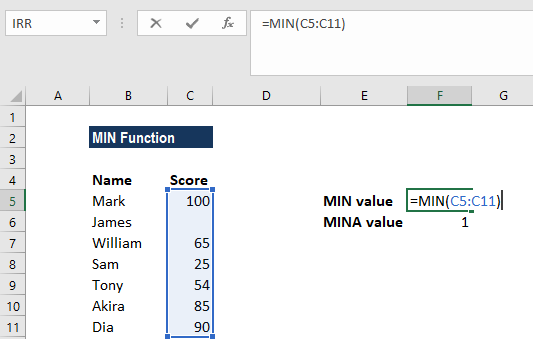 How to use the MIN Function in Excel? The MIN function ignored the empty value and returned 25 as the result. #VALUE! 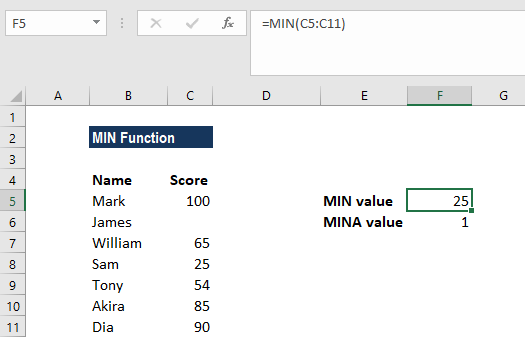 error – Occurs if any values that are provided directly to the MIN function are non-numeric. The primary difference between MIN and MINA is that MINA evaluates TRUE and FALSE values as 1 and 0, respectively. Hence, if we wish to include logical values, we need to use the MINA function.